► Which comes out on top? If we're being rational about things (and no one ever had any fun being rational), nobody really needs a modestly sized estate car that can do 0-62mph in 4.0sec. But isn't it great that such things exist? More pointedly, isn't it a pity there aren't a few more of them? 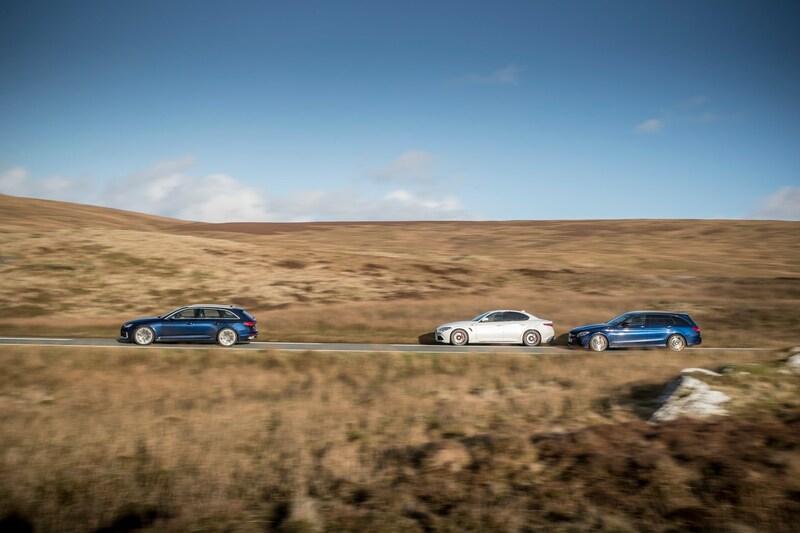 As the new Audi RS4 Avant rolls into British showrooms, it finds itself with only the Mercedes-AMG C63 Estate as a direct opponent. The RS4 is estate-only (or Avant in the Audiverse), and it wears its tailgate well. Those bolstered box arches are a whole 24mm wider each side than the regular A4 Avant, and they bring some visual excitement to the rear end – a job done at the front by LEDs that look like Morris-dancing light sabres. The RS sits 30mm lower than a normal A4, but looks lower still from the rear thanks to the extra visual width brought about by the cavernous oval exhausts and fake vents bookending the tail lights. While the AMG and Alfa are both about as rear-wheel-drive as cars get, the Audi could only ever be all-wheel drive. The RS4's now on its fourth generation, and where its predecessor featured a naturally aspirated 4.2-litre V8, Episode IV jettisons a couple of cylinders and adds a pair of turbos to its 2.9 V6. You can guess the outcome: same power, more torque, less CO2, more miles between fills. The same engine features in the mechanically twinned RS5 two-door coupe. If the Audi is all pressed creases the Alfa is entirely organic voluptuousness. It too houses a twin-turbo 2.9-litre V6, within 3cc of the RS4's but somehow packing a whole extra 59bhp, for a peak of no less than 503bhp. From under three litres! With peak power towards the rafters of its rev range and a giddy appetite for revs, the Quadrifoglio's V6 feels (and sounds) like the engine from a supercar; it's a huge part of the Alfa's seductive, larger-than-life character. Merc has downsized too. The previous-gen C63's 6.2-litre naturally aspirated V8 was one of the most charismatic engines there's ever been, but it's to AMG's credit that the new 4.0-litre twin-turbo has kept much of its character. 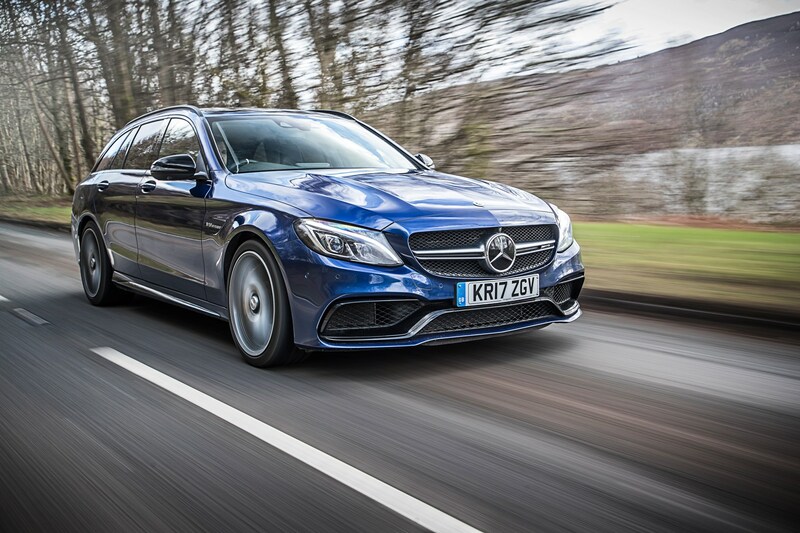 For all the C63's swollen arches and (optional) ceramic brake discs like manhole covers, you'd be forgiven for mistaking it for a regular C-Class estate at 20 paces – until it starts up. In a kind of ground-level sonic boom, the V8 rattles windows, twitches curtains, and snorts and snuffles through its four exhaust outlets like a dragon with a cold. Blip the throttle to clear its throat and there's enough torque to rock the car across its centre line, like a classic muscle car. That same 'hot-in-vee' V8 features in all sorts, from AMG GT supercar to GLC63 SUV, and will even barrel down the Mulsanne straight later this year in Aston Martin's Vantage GTE racer. It's not working quite so hard en route to our test location in Wales, with rain falling so heavily you wish Mercedes had given the wipers another gear to keep up with the downpour. 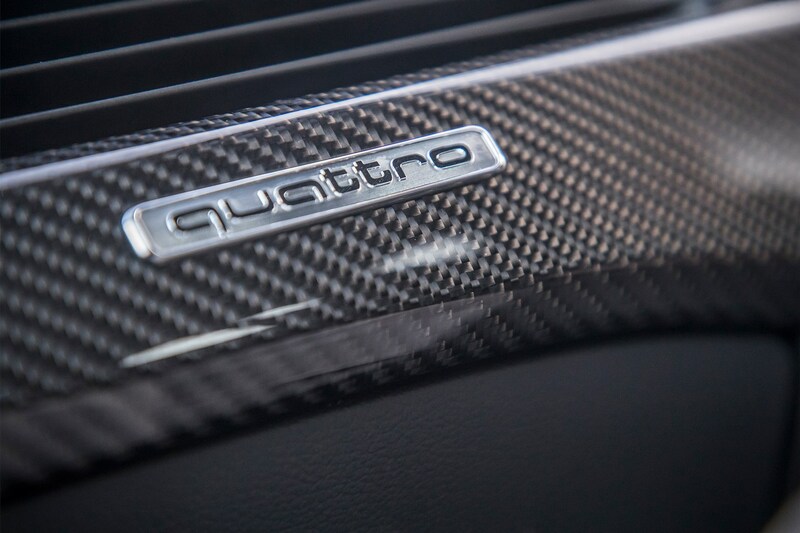 There are some unseemly rattles coming from the front passenger door 4 trim unbecoming of a £70k car, backed up by a boomy echoing from the rear, and the 245-wide front Michelins kick up plenty of road noise – more so than the Audi's 275s. It's immensely comfortable, though. This test car's S-specific Performance sports seats might look gaudy but they're superbly supportive, with plenty of adjustment. At lower speeds the Merc's engine and gearbox aren't quite fully on speaking terms, shunting and hunting for the right gear. 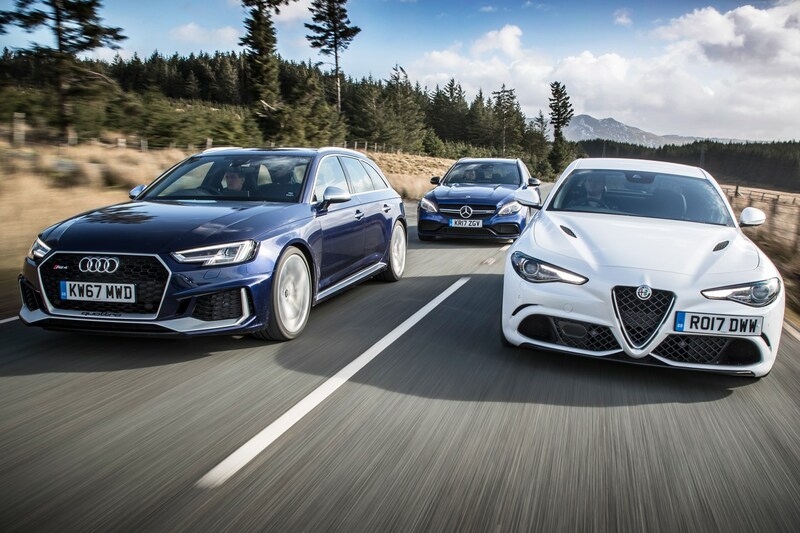 (None of these three cars uses a double-clutch gearbox, or has a manual option in the UK, though the Giulia does overseas.) 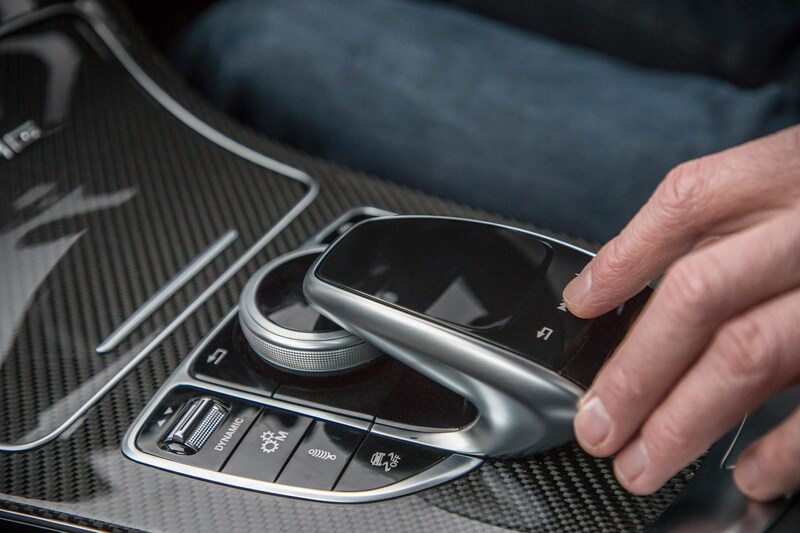 Using the AMG's manual paddles as a mediator helps, and you can forgive the odd loss in translation between engine and transmission – they've got a lot of torque to deal with. And on these roads, slipperier than an eel selling counterfeit watches, so does the driver. The C63 really is tail-happy. We know from past encounters there's a great chassis in there, but there's so little grip in the winter rain it's hard to make the most of it. I know the RS4 travelling the same route behind me in the darkness is making easy, laser-guided progress through the murk – the C63 is Kyle Reese to the RS4's original Terminator, which absolutely will not stop, no matter the conditions – but I also know the Audi driver's not having quite as much fun. As we cross the border into Wales the roads become merely wet rather than sodden, the tyres find grip and warmth, and the C63 finds its poise. Crikey it's good. Front-end grip is huge, with a neutral balance on turn-in helped by good pitch control under braking. The C63 doesn't really have understeer in its repertoire. You feel what the front tyres are up to through the steering, and the rears through the chassis beneath you. Now that temperatures have picked up there's actually a surprising amount of traction, short straights devoured through the front grille with a 516lb ft wallop of acceleration, and spat out of the rear with a lip-smacking exhaust crackle. It's exhilarating. This being the top C63 S variant, with 503bhp (same output as the Alfa) to the base C63's 469bhp, it gets bigger wheels, dynamic engine mounts and an electronically controlled limited-slip differential, measuring steering angle and throttle position to work out exactly how much grip/slip you'd like from the rear tyres. With the stability control set to Sport mode, it allows a fair degree of oversteer without scaring you – like rock climbing and clipping in as you go, if you slip you'll fall a short distance before being caught safely. There's a further 'fully off' mode too, but you need to be confident in your free-climbing ability to explore it. When I swap into the RS4, the roads have dried and North Wales is bathed in golden sunshine, its snow-capped peaks doing a convincing impression of the Alps. If the C63 is all about oversteer-hungry drama, the RS4 is the opposite; there's so much grip and traction it feels like you could veer off-road and keep driving up the side of the mountains at unabated pace. 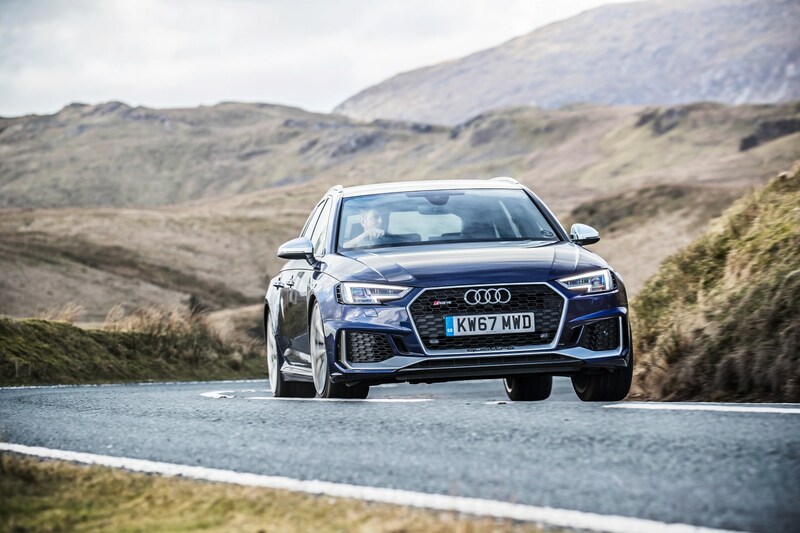 That's not to say it's not fun – you can manipulate the RS4's attitude with weight transfer, and although its torque delivery is rear-biased you're more likely to throw shapes with a lift of the throttle than a bootful of it. But its limits are so high you're unlikely to scale them unless you're being particularly forceful, and you'll be travelling so fast when it does let go that the likely resulting impact would be pretty forceful, too. The torque converter goes about its business unobtrusively in auto mode, with the occasional jerky sensation when downshifting in manual mode, but 90 per cent of the time you're unlikely to hanker for the previous RS4's dual-clutch 'box. 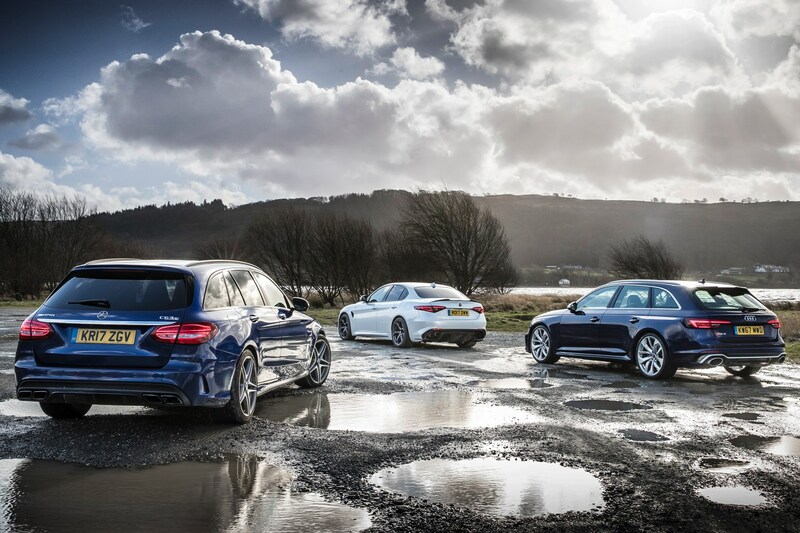 All three of these cars can be specced with optional ceramic brakes; our RS4 test car hasn't, the AMG and Alfa have (at an eye-watering £4285 and £5500 respectively, plus £250 for red paint on the Alfa's; the Audi's would be £6000). In isolation the RS4's steel brakes feel terrific, and in the majority of driving situations you wouldn't hanker for the ceramics, but the initial movement of the pedal feels like freefall after the short-travel stoppers in the C63 and Giulia, and it's slightly less easy to modulate. Steering feel is more remote than the AMG's, but it's not bad – far better than you might expect given the RS4's gigantic front tyres and past fast-Audi form. This car doesn't have the optional variable-rate Dynamic Steering we tried on the launch, thankfully; its inconsistent feedback does the car no favours. This particular RS4 is on standard fixed-rate suspension, too, rather than the optional hydraulically linked adaptive dampers, but wears optional 20-inch wheels (19s are standard). Its primary ride over large bumps is superb, but there's a surface patter over smaller bumps, as if you're driving across a giant stretch of over-starched corduroy, which can become annoying on a lumpy motorway. It makes light work of Welsh B-roads, though, and it's as undemanding to drive quickly (and it really is very quick) as it is to drive slowly – the RS4's ethos to a T.
Meanwhile, the Giulia just wants to go fast. All of the time. Whoever at Alfa programmed the creep function for the automatic transmission clearly has a particularly liberal definition of the term. Take your foot off the brake and the Giulia shoots off like it's making a racing start, even before you've touched the throttle pedal (whether you're in4 first or reverse). And to slow it down you'll need calves like Mark Cavendish. The optional carbon-ceramic brakes really do need a proper heave, to the point that you start to wonder if it might be a peculiarity to this particular test car. It can sprint like Cav, too. 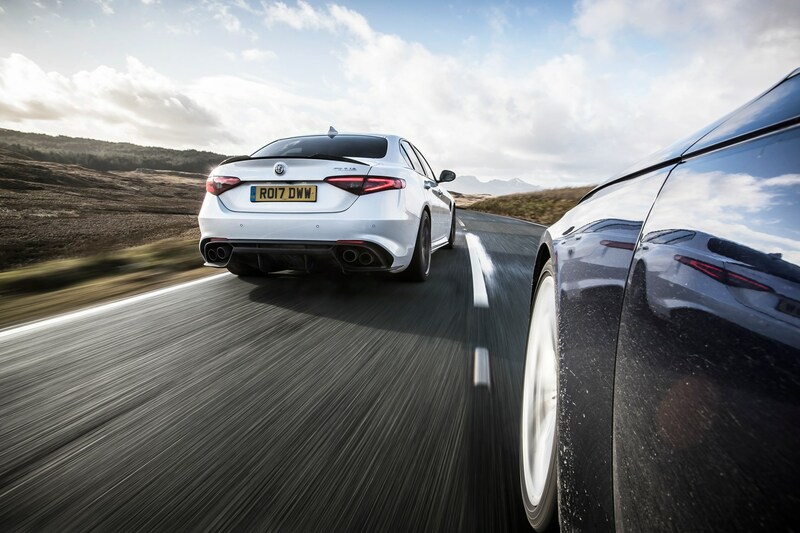 Funny how other cars can desensitise you to speed; first time I drove a Giulia QF was on CAR's 2016 Sports Car Giant Test, where it rubbed arches with McLarens, Ferraris and other mid-engined missiles. I thought it felt swift enough, but not remarkable. What was I thinking? Because goodness-golly-by-gum it's quick. With grip to match. This Giulia, CAR's own long-term test car, has recently had a new set of boots (you'd need a healthy rear tyre budget to run either the Alfa or the C63), and on fresh P Zero Corsas the lateral cornering forces it can summon are truly incredible. Enough to pulverise to mush any sandwiches that happen to be in the boot next to a camera bag, as it turns out. And that's why nobody involved in this test had any lunch. Sorry chaps. Flicking through the DNA switch (for Dynamic, Natural and Advanced Efficiency) firms or softens the adaptive dampers and throttle response accordingly. In Natural, body roll is pronounced and if anything the Giulia feels a bit too loose-limbed. Switching to Dynamic turns the ride a tad brittle, and the chassis doesn't quite breathe with these undulating roads. Goldilocks, assuming she were feeling brave, would keep turning the switch past the 'are-you-sure?' resistance at the end of its travel that signifies Race mode, then press the additional damper button on top for soft-ish Mid mode, for the best compromise. In Race you really are free-climbing without a harness as the stability control is completely switched off, but the Alfa has such well-telegraphed handling and phenomenal grip (on fresh tyres in the dry, at least) that you respect it rather than fear it. The Quadrifoglio's power steering is light, and speedily sensitive off-centre – yet without much feel, which can be a bit disconcerting at first, like playing a Gibson Les Paul with feather-light ukulele strings. As you tune into it, however, you find yourself appreciating the lack of lock required, making small, neat inputs as you would in a Ferrari. 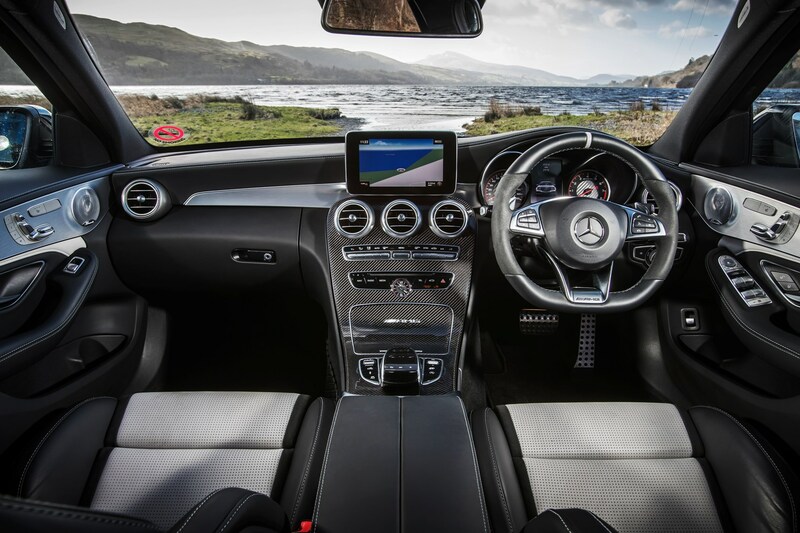 The AMG's steering is nicer still, though; weightier, more measured in its response, but still quick enough to easily nip oversteer in the bud without repositioning your hands on the wheel. Straight-line performance feels similarly potent to the Giulia, the C63 packing the same power and even more torque,4 from lower revs. The RS4, too, is quick with a capital F, but it doesn't pull for the redline as hard as the Giulia, and although it sounds fruity enough (the raspy exhaust tone artificially enhanced through the speakers in certain modes), it's a more muted, insulated environment overall. Which might be just what you're after. Certainly the RS4 is by far the nicest environment to sit in. Sensible yes, sober perhaps, but with trim panel gaps measured in microns it's like an alcantara-lined bank vault in here. Depending on your standpoint, you'll either be frustrated or delighted by climbing into a car without a touchscreen, as each of the trio uses a distraction-beating clickwheel and shortcut buttons to operate their infotainment screens. The RS4's ergonomics are the most convincing; everything's where you'd expect, and while there's more than one way to do everything, via steering wheel switches or central MMI controller, it's intuitive and easy to learn. For all that's been written about the configurable Virtual Cockpit set-up as a game-changer, I found myself using the conventional central screen and ignoring the additional nav and media displays behind the wheel. 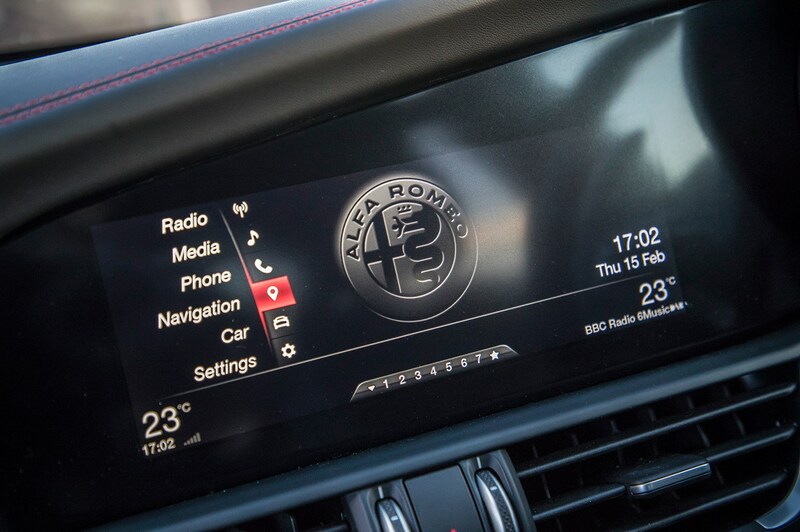 The Alfa's narrow letterbox screen appears half the height of the Audi and AMG's, and its tiny reversing camera display looks like someone's stuck a smartphone screen on the dash. The map graphics are too basic to be worthy of a £60k+ car. 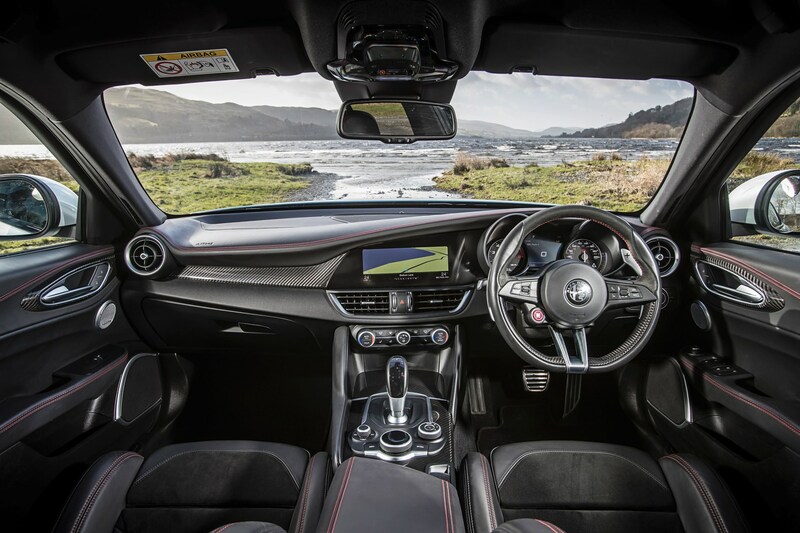 There are some risible plastics lower down the dash, and some wobbly fixings further up, but given the Giulia's heroically tight development deadline, you can see why some corners were cut. It's attractive overall, and the steering wheel is a particularly lovely blend of suede, leather and carbonfibre, with thin, tactile grips for a proper quarter-to-three position. It needs more reach adjustment, though. It's a stretch if you're tall and move the seat back, but a long-arms, cramped-legs driving position is a classic Italian car staple, right? The Merc's the gaudiest of the trio, but also the most visually interesting. The mysterious dust of age that dates an interior is just starting to settle on its once futuristic shapes, but there's still a fine sense of occasion to its swoopy surfaces and sculpted details. Plenty of places to store stuff, too. I think it was Disraeli who said 'there are lies, damn lies and official boot litre figures,' but the RS4's on-paper 505 litres to the C63's 490 plays out in reality; although neither boot is huge, the Merc's is shallower. The RS4 carried more of our bags and photography gear with the seats up, although the C63 can claim a touch more theoretical space with them folded. As for the non-estate, the Giulia's actually pretty practical, with a relatively deep boot and reasonable space for tall rear passengers. Assuming they can fit through its curiously tiny doors, that is. In many ways the RS4 is the car you'd most want to live with, and be proud to own. 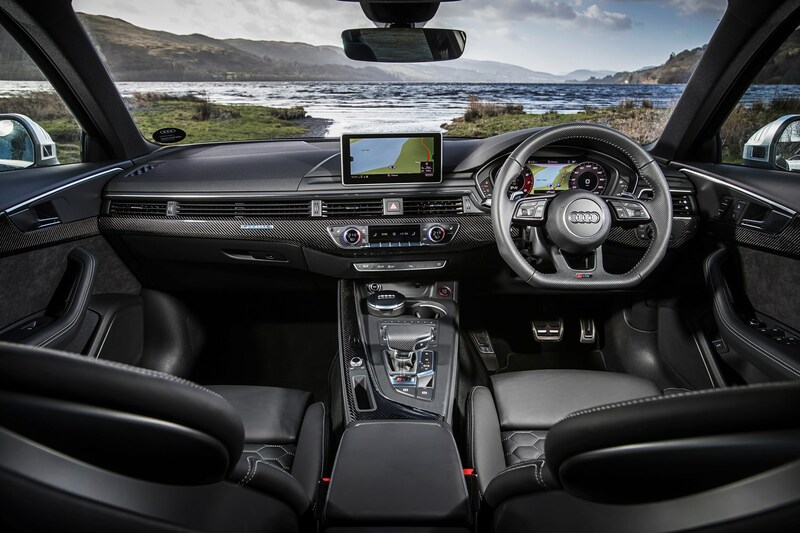 It has the best interior, it's unstoppable in the wet, fast enough to make you grin like a Cheshire cat, and entirely undemanding to drive quickly – and that's a double-edged compliment, because the RS4 is unruffled to the point of feeling more like an S4 than an ultimate RS model. Money-no-object, you'd have an RS4 in your garage for weekdays, and one of the other two for weekends. But which one? The Quadrifoglio is a landmark achievement, the first great driver's car from Alfa in years, with innovative engineering and physics-defying dynamics. But the C63 has the better body control, the more communicative steering and the most charismatic engine. 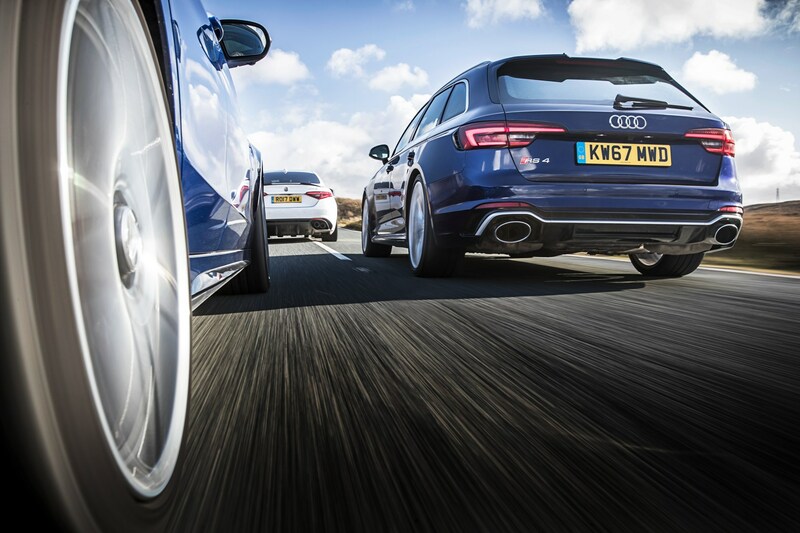 It's a dizzyingly exciting sports car that happens to be an estate, and the one you'll remember driving for longer. Who wants to be rational, anyway? The most characterful engine, most involving chassis and biggest grin on the driver's face. Astoundingly fast. Just needs a more polished interior and tighter body control. The ultimate all-weather performance car, and a better estate than the Merc but short on personality.